I'm not gonna lie: I have made so many of these little cuties! I made a ton last year for my tree, then this year, I designed my own candy cane and made some more. I purposefully designed my own this year so I could sell my finished product, but designing a candy cane is rather simple to do. If you're looking to make candy canes for yourself or for gifts (ie. not for profit), you can find a candy cane ornament template online very easily. First, choose a template online or design your own. Once the template is printed/drawn, cut out the individual pieces. I personally like the simplicity and design of a candy cane with 4 red stripes vs. more or less. You'll need 2 white pieces for each ornament you are going to make, so be sure you cut your white pieces out accordingly. After all the pieces are cut out, simply pin on one red piece at a time, starting with the top most piece and sew it on. I used a straight stitch. To sew on the red pieces, you will only sew the non-border sides of the red. So for the top most piece, I sewed the two lines going up and down. I did not sew around the edges. After all the red pieces are sewn on, again making sure not to sew them on the border, make a loop for your ornament to hang on the tree. I always make my loop on the backing piece. Next, pin your backing piece with the loop to the top piece with the red stripes. 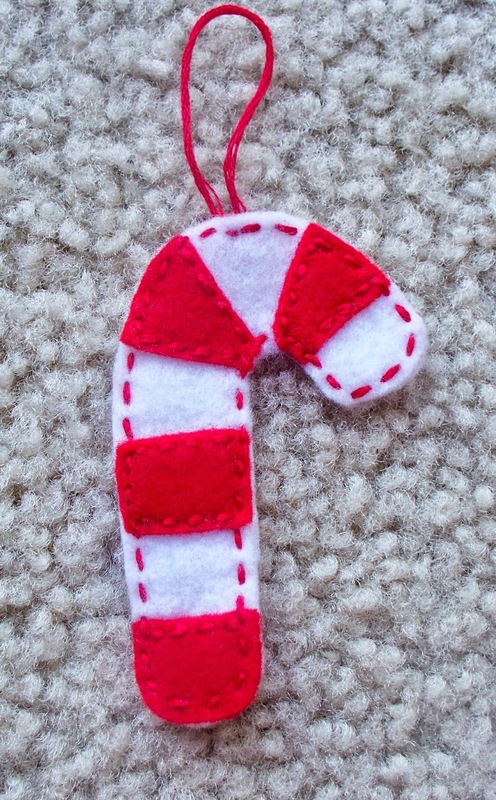 Now, you will sew all around the border, which means at times, you will sew through three pieces - the two white candy cane pieces and the red stripes.